In the final years of the 19th century Marconi worked to extend the range of his radio signals and to demonstrate their practical value. 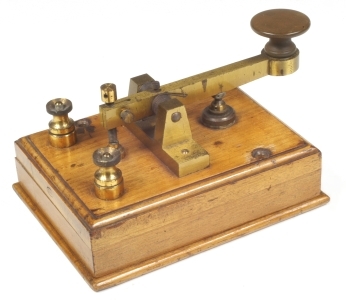 He established stations on the south coast and the Isle of Wight, successfully exchanged signals with ships at sea and in March 1899 transmitted the first wireless message across the English Channel. He had not neglected the commercial side, establishing a factory in Chelmsford in December 1898. 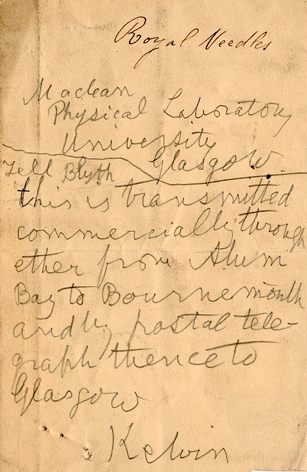 Once he went beyond simple demonstrations of radio transmission and reception, Marconi had to tackle the problem of interference between signals. The answer was ‘tuning’ – the ability to transmit waves of a particular frequency and to adjust the receiver to accept one frequency at a time. Tuned Transmitter, by Guglielmo Marconi, 1899. Marconi’s first tuned transmitter, completed at the Haven Hotel, Poole. 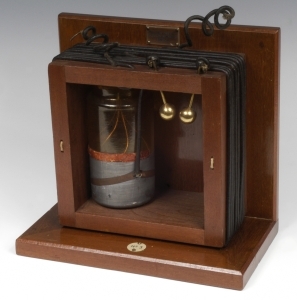 The square wooden frame carries two windings, one linked to the Leyden jar and the brass balls that form a spark-gap. The single turn of the second winding was connected between an aerial and earth. Morse Key, c.1900. This key was used by Marconi during his experiments on tuned circuits at the Haven Hotel, Poole in c.1900. It was the first type of key designed specifically for wireless work. 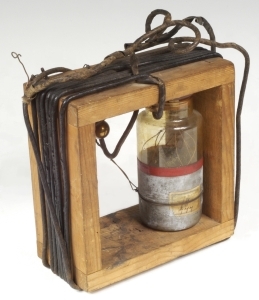 Tuned transmitter, by Marconi’s Wireless Telegraph Co. Ltd., c.1900. A commercial version of the experimental tuned transmitter. In June 1898, Lord Kelvin visited Marconi on the Isle of Wight and insisted on paying for the sending of messages by wireless telegraphy and onward by cable, thus challenging the General Post Office’s monopoly on telegraphy. Here he records the ‘ether’ or wireless message he sent.